Home » 360° Camera Comparisons » Insta360 ONE vs Samsung Gear 360 – Is it worth an upgrade? Two 360 cameras face off. One is a newcomer with some outstandingly innovative 360 video features, another is the cheapest 4K 360 camera ever. In this comparison between the Insta360 One and the Samsung Gear 360, I’ll be taking you through the specifications of each camera and showing you the differences between each of them. I’ll be honest from the start, this isn’t a particularly fair comparison and if you only want to know which one is better i’ll tell you right now – it’s the Insta360 One, by a long shot. 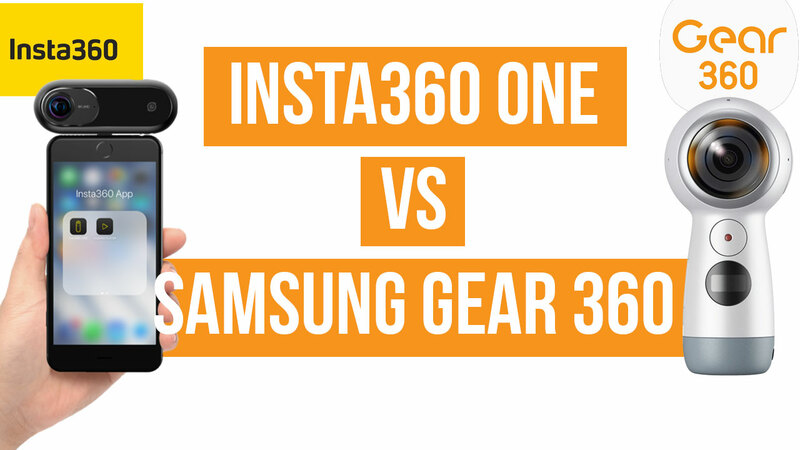 The reason I’m doing this comparison is because for a lot of people the Samsung Gear 360 was their first ever 360 camera, and the Insta360 One looks set to be very popular – is it worth upgrading? You could very well be fooled into thinking that the Gear 360 is the superior device judging from just these specifications. While both shoot 4K 360 video, the Gear 360 shoots at a higher resolution, with more battery capacity and at a cheaper price. Never the less, I can assure you that the Insta360 One is the superior device even if it shoots lower resolution 360 video. Let me explain why. When it comes to video resolution (the number of pixels) isn’t everything. Frame rate and the type of lens used it of equal importance, and this is where the Insta360 beats the Gear 360. The Insta360 One can shoot 360 video at 30 frames per second where as the Gear 360 can only manage 24fps. This might not sound like a huge difference, but the result is that the Insta360 One video appears to be a lot smoother. The quality of the lenses used in the Gear 360 is also pretty poor, it doesn’t pick up colors all that well and can look a bit blurry. The video from the Insta360 One is a lot brighter, more colorful and you can pick out details from objects far away from the lens. Neither camera can shoot the best 360 video ever but the Insta360 One is the clear leader out of the two. 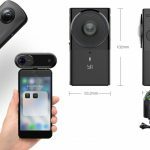 Bullet time – Insta360 showed off this type of video when it launched the camera, and it looks really awesome! This video effect is accomplished by shooting in slow motion and literally swinging the camera around you. The resulting video looks like something out of The Matrix. Smart track – This mode allows you to lock onto a specific moving target and have the frame follow them wherever they go. You don’t need to move the camera because it’s capturing everything around it. A intuitive way of utilising 360 video. These three video modes are what make the Insta360 unique, however all of them are a result of new software, rather than any particularly unique hardware. Could other companies, such as Samsung, update their 360 camera software to enable similar features? There doesn’t seem to be any hint of this on the horizon, so for now the Inst360 One is certain to shoot better quality 360 video in more unique ways than the Gear 360. This is an area where the Gear 360 struggled. The Samsung device was clearly designed as more of a video camera as it can only shoot 15 megapixel images, which is pretty low compared to what is needed to make a 360 photo look good. In comparison, the Insta360 One can shoot 23.8 megapixel images, which results in much clearer images. You also have more manual controls when using the One, so you can adjust the camera settings to work better in different lighting conditions. The Gear 360 does also have some manual controls, but you can’t change the exposure time, making low light photography difficult for instance. That being said, the Gear 360 is perfectly adequate if you are simply looking to take some 360 photos to share on Facebook. Video stabilization – Very important if you want your 360 video to look smooth. The Gear 360 has no stabilization feature but the Insta360 One has software stabilization. This has worked well on the company’s other cameras. Battery – The Gear 360, with a battery size of 1160 mAh, will last just over an hour of continuous usage. The Insta360 One has a smaller battery, so don’t expect to be shooting video for longer than an hour. Design – The Samsung Gear 360 is designed to be hand held and will connect to your phone via WiFi, where as the Insta360 One attaches to the charging port of your smartphone. You can use the Insta360 One without a phone, but there are limited manual controls so you may struggle to get the most out of it. I actually prefer the design of the Gear 360, I’ve found it very easy to use handheld and connecting to a smartphone is automatic after the first time you use it. This is where it gets interesting. The Gear 360 may be beaten in almost every way by the Insta360 One, but it’s also ridiculously cheap. You can get a Gear 360 for between $180 – $200 which is so cheap for a camera than can shoot 4K 360 video. If you’re simply looking for the cheapest camera than can shoot decently quality 360 video and that’s easy to use, you can’t go wrong with the Gear 360. The Insta360 One is priced at $299, which is nearly double the price of the Gear 360. Is it worth the upgrade? I personally think so. 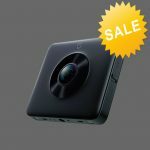 You’ll be getting the most innovative 360 camera ever and compared with other cameras on the market it’s actually reasonably priced, given its unique specifications.